The deficit is futuristic arcade races there. Brand Wipeout, apparently, Sony will never revive — worked on these games Studio is closed. Well, at least the collection of the three best parts of the series last year came out on PS4. And more to remember and nothing, so the announcement of the Trailblazers I was very happy, especially when I found out about its unusual game mechanics. The game is distinguished by the absence on the slopes of accelerators in the usual sense of the word. Fireballs are increasing their pace when driving on the painted areas, and they paint them yourself. This happens either by pressing a special button, or when travelling through the blue gate that is always located in the same areas. Therefore, control of the game as simple as possible. There are gas, brake and button for splashing of paint. If you press “triangle” on your controller to the PS4 (or the corresponding button on the keyboard), the dye will spill out of your car in a straight line and swayed by opponents going ahead. Nothing more pressing is not necessary, except for turns with the help of stick. In the race involved two teams of three riders each, so already from the beginning, clean the track is covered with paint of two colors. If you go to a stranger to Collier, the speed change can not be, but if it enters their “territory” it will immediately start to grow — the longer you stay on the beaten path, the greater will be the multiplier. So it is possible to accelerate four times as much compared to the usual pace! A great idea is implemented and have no complaints — I have never been in a situation where the game was incorrectly identifying my location on the site, painted in the colors of my team. If the part of the track the enemy is already stained, nothing prevents to lock this place down your paint, forcing him to rebuild on the next round. Or on the same, if he goes behind you. That is why the developers called Trailblaizers “cooperative racing game” — a cohesive team really more likely to succeed than inexperienced individuals. Periodically, the trail divides into three paths, fenced obstacles, and you can negotiate with companions about painting all three sites. And on a following circle choose the one that uncoordinated enemy team didn’t touch, and break far ahead by accelerating. Or invent some other ways to outsmart opponents. Unfortunately, this would be problematic because of the empty online. Despite the support cross-platform multiplayer, to find players for at least one match I failed. And Trailblazers is pretty expensive, and advertised it sluggish. Not helped by the fact that the founder of the Supergonk Studio that created this game, Ben ward (Ben Ward), worked in the now closed Bizarre Creations on Project Gotham Racing and Blur. But Trailblazers — not only a multiplayer game. She offers a full story campaign, consisting of several dozen chapters. Call it training mode, which gets the user to race online, it would be wrong, as each new arrival is accompanied by well-written dialogues. The game is not an exciting story, but the characters talks to each other not tired, and from time to time you can laugh at a good joke. The only thing that is slightly annoying is the laughter of characters at the beginning of each new phrase. The technique used in visual novels, it all sounds so forced and strained. As you progress through the campaign you get acquainted with all the available heroes, the cars have different characteristics. Someone faster, picking up speed and someone the supply of ink is consumed more slowly. The difference is small at first sight, but during the race it is felt: it may not be enough paint to fill the gap between the lines drawn teammates, or it becomes difficult to catch up with the opponent because of not very high-spirited car. You have to slightly change tactics and to consider the strengths and weaknesses of the chosen hero. Each story Chapter proposes three tests and, as I understand it, for passing a level sufficient to perform at least one of them. 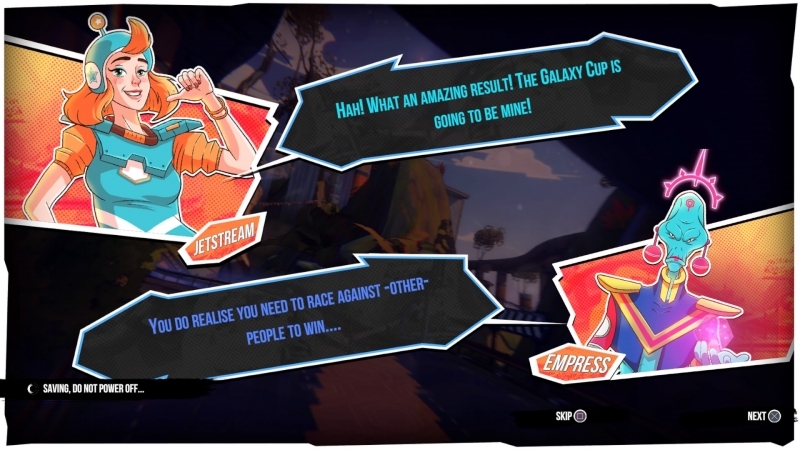 Some tasks are very easy (to pass through 15 rings, shoot paint in one enemy), others may be forced to restart the race over and over again — in a couple of hours, for example, opens with a mission where you need to take a leading position in each of the four rounds during a single race. To access the next assignment could come only on the same lap, but just give up I did not want. Although the medals, which are issued for testing, it is impossible to use for anything useful to their still nice. Trailblazers in enough modes to not get bored from the monotony. The main one in which no matter what account you come to the finish line — it’s more important to score as many points for his team splashed the paint, driving through the painted areas, and in any case not touching the fence or other riders. Even if you gained tremendous speed and watch for score multiplier points, your performance is getting better and better, one wrong move will result in the loss of all earned points and could spell defeat for the team. 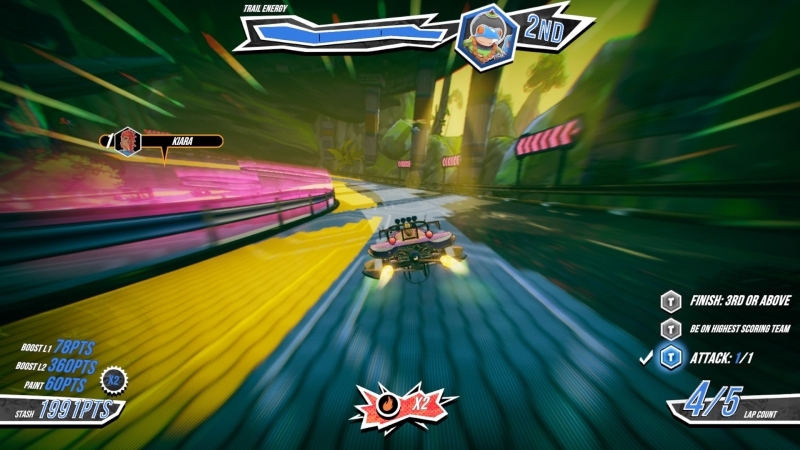 In another mode, you can manually paint the track, but the gates are placed at every step and disappear after their first use. 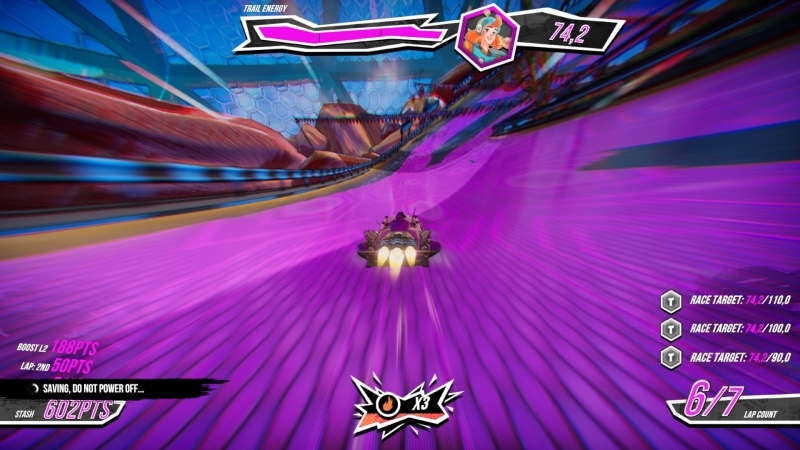 Acceleration works on the same principle as in the other modes, so the most agile team will try as soon as possible to activate all the gates and will color the track in their colour. Just Trailblazers ten unique tracks, each of which has several variations, so with diversity there is no problem. On some tracks there are small dips in performance, but they don’t have much in the way and collisions will almost never lead. If you don’t count occasionally falling fps, Trailblazers difficult to find some significant drawbacks. All the items are well made, stylish from the main menu and ending with a good soundtrack. Famous songs you’re in the game for obvious reasons will not hear (the budget was obviously modest), but all the tracks sound amazing and are reminiscent of the music from Jet Set Radio is as Groovy, but at the same time, unobtrusive electronics. It is a pity that Trailblazers is hardly prepared for the success and Packed to the servers. 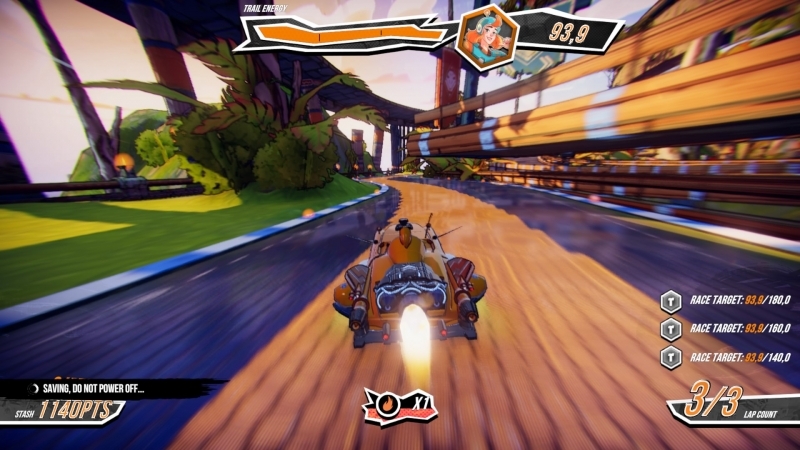 This original and striking race, which the authors implemented perfectly the unusual genre of the idea (borrowing it from Splatoon, but that’s another story) and offering a fun entertainment for fans of WipEout and F-Zero. But even if the multiplayer will continue to be “desert”, there is always a lengthy single player campaign with lots of missions and tests — it is worthy of attention and she clearly put a lot of effort, and not as is usually the case in racing. the multiplayer certainly will remain vacant. Graphics Nothing outstanding, there is no schedule, but the game looks very stylish and bright. When riding at high speeds there are no problems with understanding where to go and when to turn to the side. Sound Good Groovy soundtrack in the spirit of Jet Set Radio. The song is not tired, and the playlist is large enough that the tracks started to repeat itself too often. Single game Long story campaign, consisting of several dozen chapters, enough for a dozen hours. Funny characters, a few (but not all) of a successful joke and a large number of tests will make the passage exciting. Multiplayer Supported cross-platform multiplayer, but I never was able to find five additional participants to start the match. But there is a split screen mode, including the PC version. Overall impression A fun mix of F-Zero and Splatoon with unusual gameplay mechanics. Even if the multiplayer will be empty, you can always spend time in good “campaign mode” or compete against friends on the same screen.